What makes the book of Job difficult is not so much the information that is clear, rather it is how we view the dialogues. God rebukes Job, yet says that Job spoke what is right about him and not his 3 friends. God does not rebuke Elihu, yet Elihu seems to say some similar things that the 3 friends say. Also the 3 friends say some things that seem to be correct. This last issue is the most problematic. Consider also Psalm 34:18; Psalm 75:7; Psalm 107:40–41; Psalm 113:7–9; Psalm 138:6; Psalm 147:6; Isaiah 57:15; Ezekiel 21:26; James 4:10. How does one make sense of all this? My conclusion is that Job's friends say a range of things, many of which are true. This is not too surprising as they are Job's friends and, as Job is righteous, he is likely also wise, and his close friends may also have some wisdom. It seems that Job's friends are mistaken in attributing proverbial wisdom to an individual case. Much of what they ascribe to God, and what they say about how things pan out for the wicked, has elements of truth. But such truth is difficult to apply to individuals. That a wicked man may lose his life early does not mean every evil man does. Moreover, it is an error deducing underlying motives or actions from consequences. It does not follow that if a sinful man suffers then a suffering man has sinned. The righteous can suffer also. Job's friends made this error, and in charging Job with sin they are calling righteousness unrighteous. This is a very dangerous thing to do. Jesus said that those who do this to the Holy Spirit are committing an unforgivable sin (Matthew 12). God takes very seriously accusations against his people. David knew this principle and would not raise his hand against Saul because Saul had been anointed by God; David refused to even while Saul was mistreating him. Job's friends were mistaken to assume that just because the wicked may get their comeuppance in this world (they certainly will in the next) then all those who suffer do so because of some sin. Their failure to see rightly meant that not only did they mistakenly condemn Job, in doing so they were unable to offer Job the friendship and comfort he needed at the lowest point of his life. The suffering of Job was grievous. He lost his wealth. He lost his children. He lost his health. But at such a difficult time he also faced his wife tempting him to sin and his friends accusing him of sin. The loss of everything and no one to comfort him. How great must have been his despair. There is more to gain from the book than this, but the above is how I currently understand the larger picture. I find the book of Job one of the most difficult to understand. Even though I have read it several times, the meaning evades me somewhat. It addresses the issue of suffering. Some point to the message of Job as being one of the sovereignty of God. Though there may be some truth to this, the concept of sovereignty does not fully address the issues raised in the book. Further, Job is the protagonist; as such it seems that the book addresses man's interactions with God, not just an abstract attribute of God. I think suffering better summarises the theme of Job than sovereignty. The structure is relatively straight forward. We have a narrative prologue and epilogue explaining the cause and outcome of Job's difficulties. The body of the book consists of poetic dialogue between Job and his friends, then Elihu, then God. The following outline breaks up the speeches where the book introduces the speaker, or their continuation. There are several things we can be sure of reading the book, but there are also many questions. So far so good, but these are not the difficult questions. Palaeontologists are at a loss to come up with the mechanism of death in fossilised copulating turtles. The paired turtles had been known for some time and, while mating had been hypothesised, the confirmation that each of the pairs were male and female, as well as some specific positioning, has strengthened the theory. Male turtles of this species, like many of their modern relatives, have longer tails than females, said Joyce. Also, males were typically smaller than females, a trend clearly seen in the fossils. Finally, in seven of the nine pairs, the turtles are in direct contact along the edge of their shells just above their tails - and in two of those pairs, the male's tail wraps below the female's shell in mating position. What mechanism would cause the death of 9 (!) pairs during mating? Toxic algal blooms; carbon dioxide in the water; other toxic substances. The proposal is oxygenated upper lake water and saturation of the lower lake water with carbon dioxide or other toxins. They claim this causes death during the act followed by preservation in the oxygen poor water. This seems a bit of a stretch, and so many pairs. It would be interesting to know if turtles stop mating during forced suffocation. I prefer the creationist proposal for fossilisation: burial in sediments such as mud and lava flows during flooding and volcanic activity. 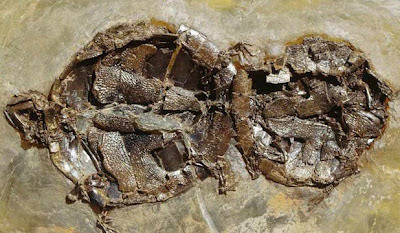 Rapid death and conditions for fossil formation occur together. This explains the mechanism of fossilisation which does not usually occur when animals die; fossil graveyards; and why animals are found in situations such as eating, or giving birth. Never forget there is more mercy in Christ than there is sin in you. Authority is closely connected to responsibility. Many are familiar with the idea that those who have authority are responsible for the outcome. They take the rap for the outcome, and also the glory. Some modernists would wish to disassociate these. All authority and no responsibility. This just allows us to feed our pride without needing to consider or reap the consequences of our actions. I think it is helpful to think of the situation in the reverse. What we have responsibility for we need authority for. People are given responsibilities for persons and property, and if we are to realise good outcomes we need the authority to action things. This places the focus back on duty and not power. The parent, the politician, the manager are responsible for people or property placed under their care. They are seeking raise godly children, or manage interactions between citizens, or develop skilled workers and maximise productivity. Thus the focus is on the responsibility. Authority is required to do this well. But the obedience of the children isn't arbitrary (though it may seem so to them), it is because there is real authority, and the real authority is there because the father has been given the responsibility by God to raise up godly children. People still make their own choices, and outcomes are not guaranteed, or determined; nevertheless, the job is nigh impossible without authority. When we are under authority we should behave appropriately: respect, honour and usually obedience. This is important because such people will be held accountable for their actions. When we have authority we are to use it based on the realisation that we will be held accountable for those under our authority. A person who primarily eats locally grown food. I was never impressed by the idea of buying food grown locally. I have no objection to local food, but some things cannot be grown in the local climate, and if something could be grown halfway around the world and still be cheaper than a local option I was happy to buy it. And I had heard that the cost per item of transporting large quantities of food may be similar to a farmer bringing in produce to the market. But it turns out the cost of transport is only a minor component of the energy used producing food anyway. In the real world, not everything is equal. Some places have more water or better pasture land. It makes more sense to grow a tomato in an unheated greenhouse and truck it then to heat a local greenhouse. A U.S. study showed that about 4 per cent of food energy signature was from long-distance transportation and 83 per cent from production. Fresh food may sometimes taste nicer: mangos in season in Australia or Asia certainly beat our imported ones from Mexico; I buy canned here. But buy what you like at an acceptable price and ignore the distance it took to get to your plate. I don’t know what kind of sentimental ideas you have about Jesus. Just read your Bibles and they’ll go away. The scribes dedicated themselves to the task of copying six hours a day for months at a time in a hunched-over posture. Often lighting was poor and conditions were harsh. One scribe described a time when his room was so cold his ink froze and his hand became so stiff he could no longer hold the writing quill. The article mentions the common Greek letters that were confused with each other: Σ, Ε, Ο, Θ; and Γ, Π, T; thus some variant readings. But your opinion is a D.